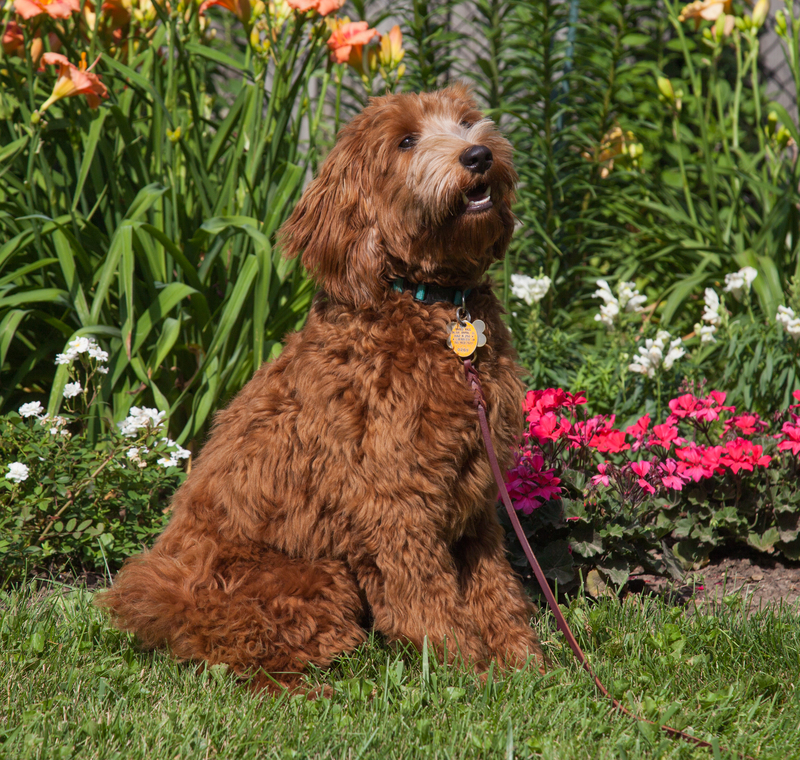 Ashford Manor Labradoodles > Meet Our Girls! 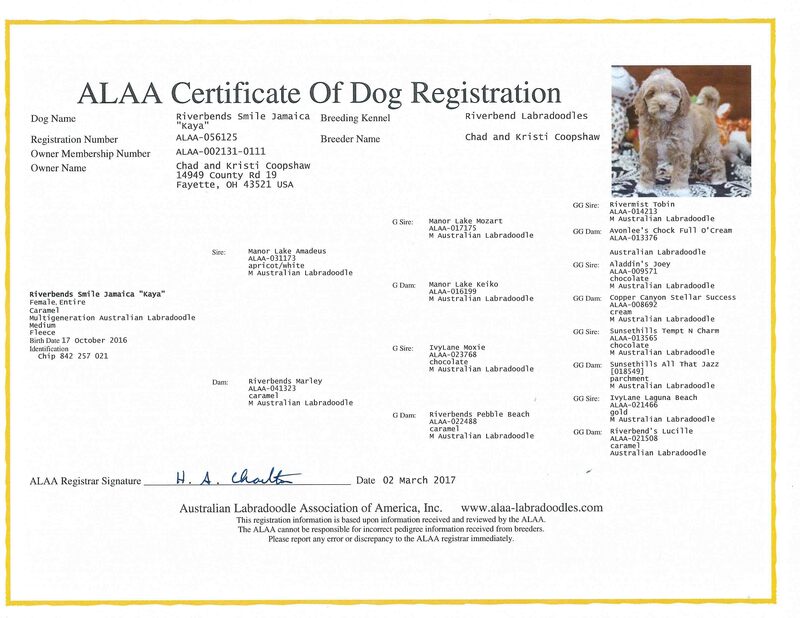 Our beautiful Australian Labradoodle girls breed in all the right traits to produce remarkable puppies for your family. We at, Ashford Manor Labradoodles keep our breeding program small so our dogs get lots of love, attention, socialization, and training. 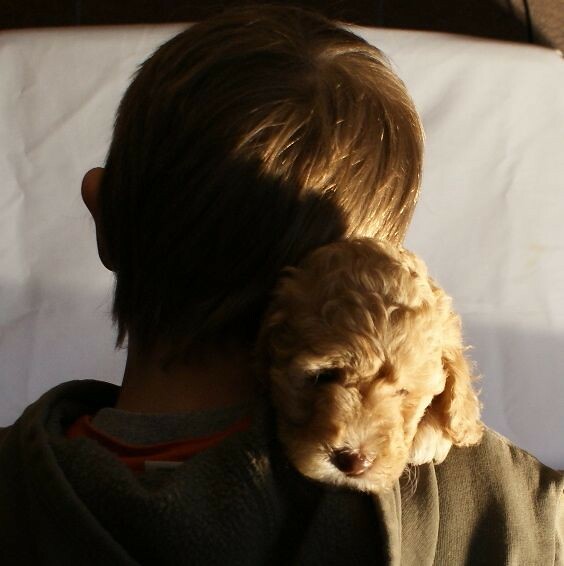 We are not a kennel, we are a home-based breeder. Bailey lives near Indianapolis with her guardian mom and 2 kids. 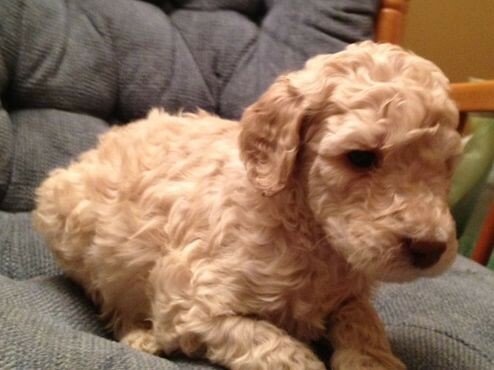 Bailey is an active little girl who loves to run and play. She is such a sweet girl and little lover! 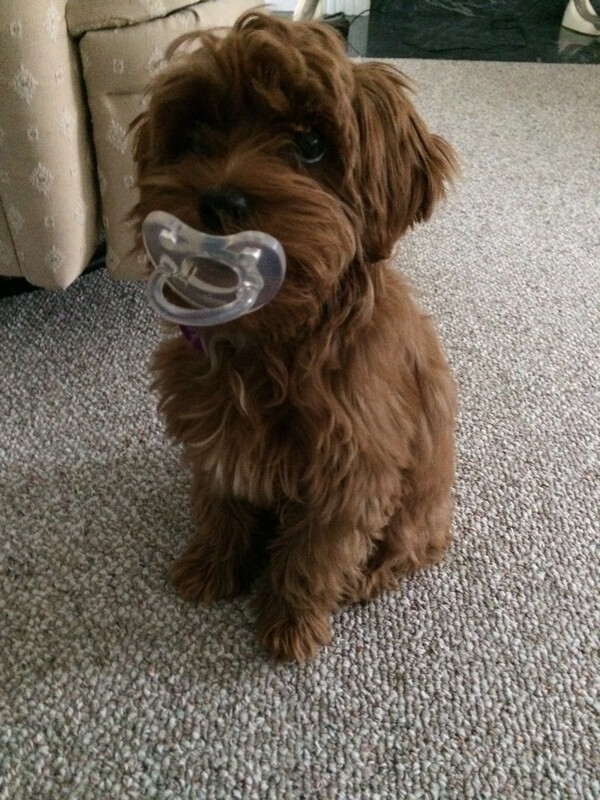 Carmello lives with her guardian in Fort Wayne, Indiana. She will be a medium size. She is a beautiful parti coloring. Carmello is a little lover, she lives with her Mom and furry brother Nelson. Carmello will keep you smiling all day long. Size: Medium, 17 1/2″ tall, 30 lbs. 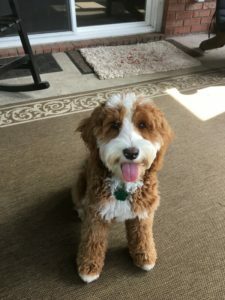 Cutie lives with her guardian family in southern Michigan. She is just as her names says, a Cutie! She has been a bundle of joy since she first arrived. 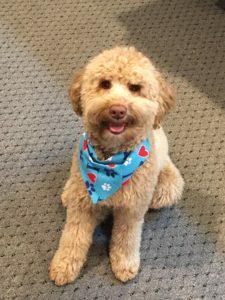 Cutie is capable of being a service dog, she is very intelligent! Galena is a miniature from our very own Mirage and Chestnut! 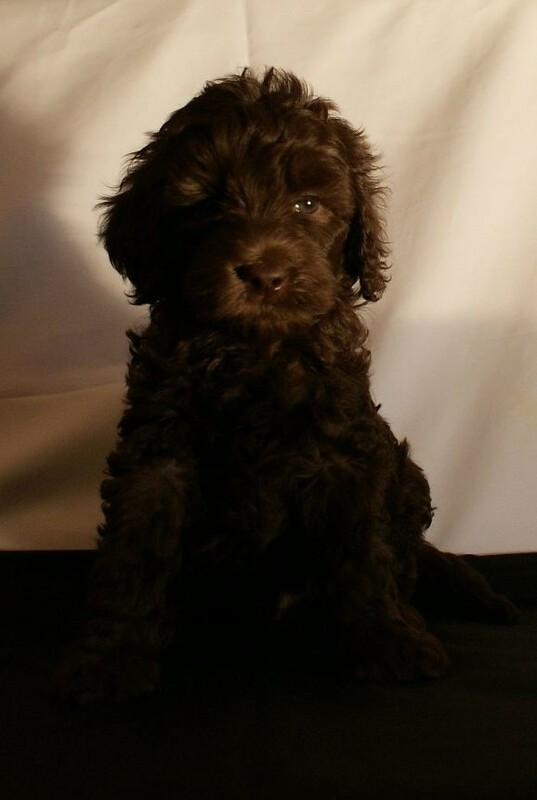 We look forward to her becoming a future breeder here at Ashford Manor Labradoodles. She has passed all of her testing now we just wait. We will probably begin breeding her in early 2020. Galena is a sweet, lovable, bundle of joy! She loves everyone she meets, and has never met a stranger. Galena loves to play and then snuggle afterwards. Galena lives with her guardian in Brownsburg, Indiana. She also lives with her mom, Mirage! She has human kids to play with all the time and get enough of people. 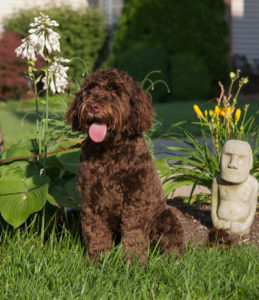 Kaya is co-owned with St. Louis Labradoodles, in St. Louis, MO where she lives with Becky Coulter. Kaya is a beautiful caramel color (rose nose) with white markings. She is a delight to Becky and her household. Testing: OFA Hips Excellent , OFA Elbows Clear, Dr. Wallace Hips Good, Dr. Wallace Elbows Clear, ACVO Eyes Clear, PPG Panel Clear by Parentage, IC is also Clear by Parentage. Joy was a Christmas puppy, born in 2014. She is truly a Joy to her guardian family here in Lafayette, Indiana. She lives with her parents, and children. Joy is best buddies with her 6 year old human brother, they are seen together all day. Liberty is absolutely amazing! She is such a playful little girl! Everyone who meets Liberty falls in love, she has such a charming disposition. 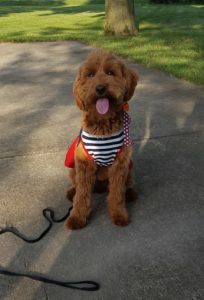 Liberty loves people of all ages and dogs! Liberty is from our very own Silvermist and Blaze, what a beautiful combo that has turned out to produce! Liberty lives here in West Lafayette, Indiana. 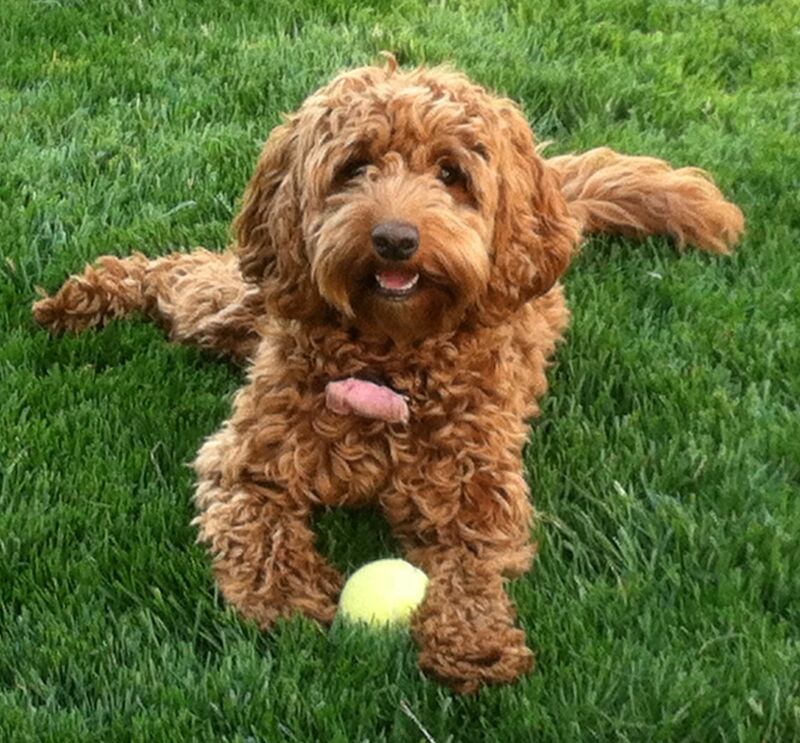 She has a buddy that she plays with everyday named Sherman, he is also a multi-generational Australian Labradoodle. Size: Large mini – small medium approximately 28 lbs. 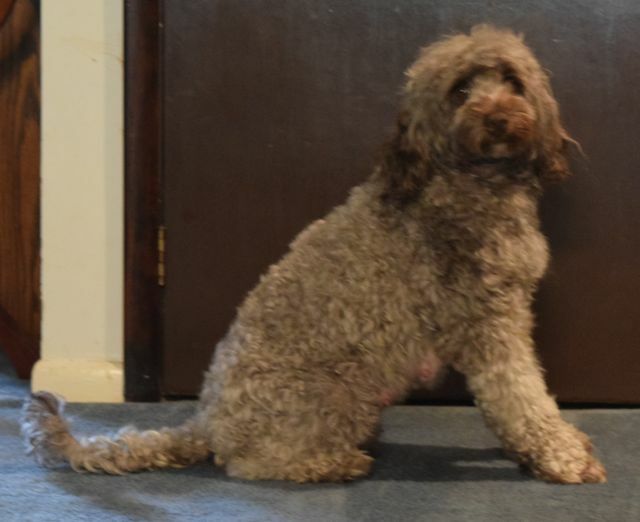 Magnolia is a mini Australian Labradoodle breeder here at Ashford Manor Labradoodles, from Summer and Keenan. 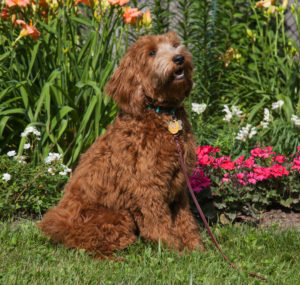 She is a delightful red Australian Labradoodle who is quick to learn and obey. Magnolia is dreamy, she is such a well behaved dog with gorgeous eyes! Magnolia has a wonderful fleece coat. 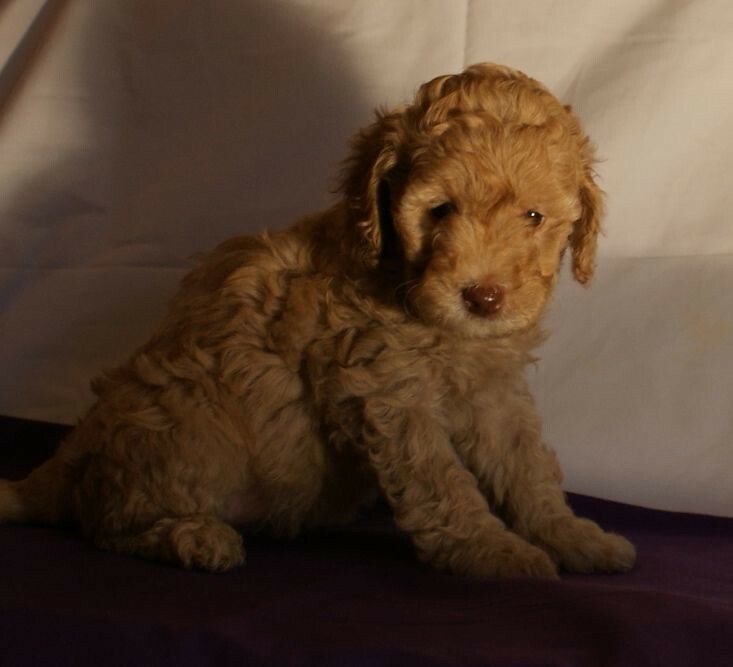 Margo is a miniature multi-gen Australian Labradoodle from our Carmello and Chestnut. She lives with her guardian family her in Lafayette, Indiana. Margo has a delightful personality that will keep you smiling. She is a very gentle little girl who is extremely smart! Mirage aka Mae loves everyone! She is a super sweet little girl that lives in a guardian home in Brownsburg, Indiana. She is very intelligent. 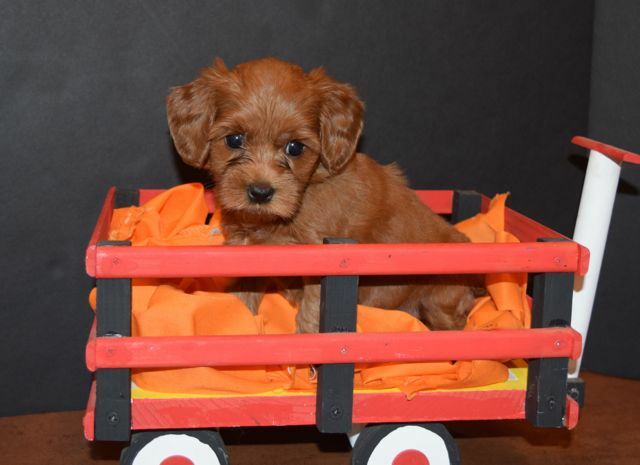 She is a beautiful caramel color and a nice mini size. Mae has since had the privilege of adding her daughter to their home. She now gets to play with Galena everyday! Nellie Belle aka Ollie lives here in West Lafayette, Indiana with her guardian home. She is a nice 40 lbs. and a solid build. Ollie has an amazing personality, she is such a chilled dog! Ollie was the only girl in her litter, she had three brothers. We love Ollie! 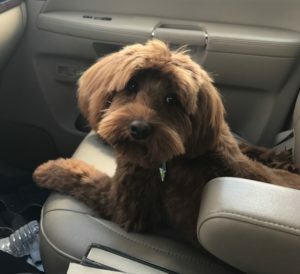 Ollie lives with her human mom and dad and 3 kids. She gets to go on nice long walks every day and cuddle up when she gets home. She is such a delight to everyone she meets. Oh Susannah is a newer member to our Ashford Manor Family, she comes to us from Aussie Labradoodles and our boy Blaze. 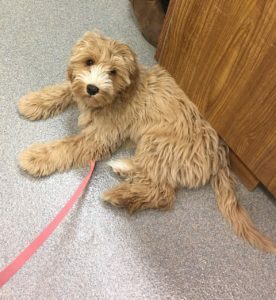 She visited us for a week recently and is an intelligent, inquisitive little girl! Oh Susannah comes when you sing her name … yes I said sing her name! She is such a delight! Oriole lives with her homeschool guardian family here in central Indiana. She loves to snuggle and play with others. Oriole is a very smart little girl who has learned everything very quickly. She is from our Ashford Manor’s Paprika and Blaze’s litter. She is qualified to do service work. Oriole spent the day with us and she also is an amazing dog, very obedient, and calm natured. Her favorite thing is swimming in her families pond. Size: Medium, 19″ tall and 30 lbs. 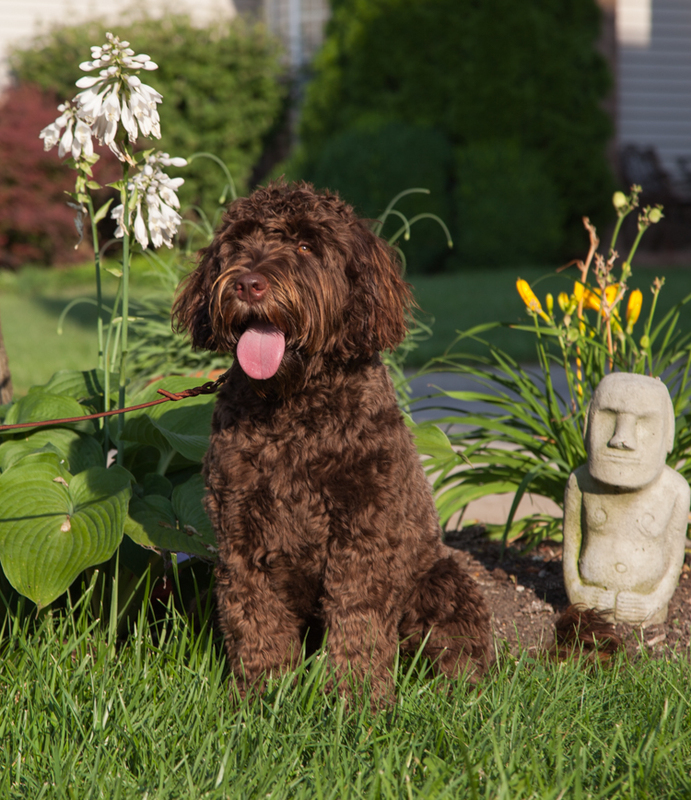 Ashford Manor’s Polynesian lives with her guardian home near Kokomo, Indiana on a farm. 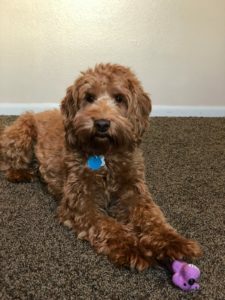 She has several kids that she gets to play with every day along with a variety of animals! Polynesian is a bundle of joy that will make you smile when you are down! If you want to play catch, she is ready; or if you prefer to snuggle up with a good book she will be your reading companion. Size: Medium, 18″ and 28 lbs. Sanibel lives in a guardian home near Indianapolis. She is a very quick learner, inquisitive, and just an all around joy to be around. Sanibel loves everyone she meets. Scarlet lives in a guardian home here in Lafayette, Indiana. She has lots of children to play with every day. She is a sweet little girl with a wonderful disposition. Silvermist is such a delight, she never misses a beat! She lives with her guardian family who sings her praises. Recently I had the privilege of spending the day with her much to my delight she loved everyone both human and four-legged friends. 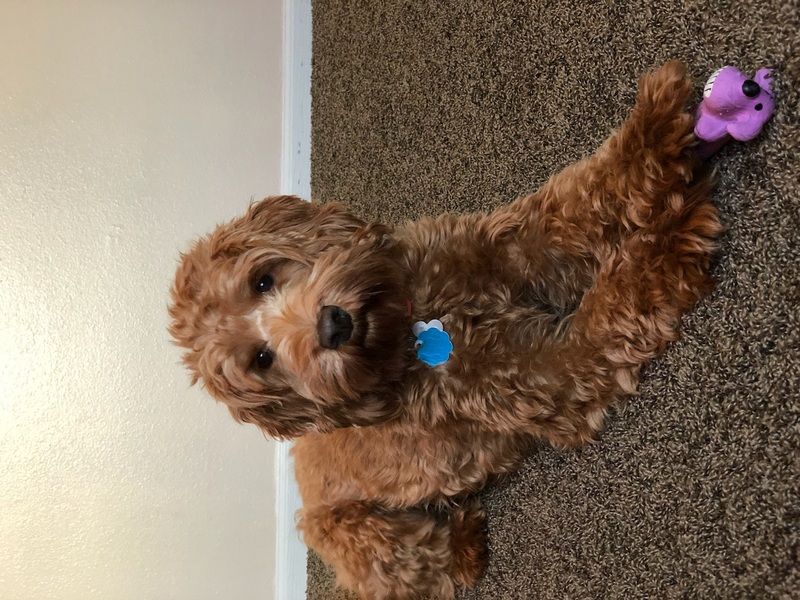 Her guardian family says she is very loving, extremely playful, loves attention, loves to snuggle next to someone or some stuffed animal, and she was the smartest in her Puppy Kindergarten Class! Oriole also loves to go on walks and enjoy the outside. Ashford Manor’s Sweet Pea lives with her guardian home near Indianapolis. She has two human brothers to play with every day. She is such a little doll, princess of the house, and mamas girl! Sweet Pea is just that, she is a refreshing fragrance as she prances around. She loves to play as well as snuggle, just a little dream. Lacey lives with her guardian here in West Lafayette and her other dog partner Cagney! Those two are best buddies and are always on the look out, Cagney is the protector and Lacey will kiss you to death! Angel is a very sweet girl and a great dog. She is extremely quick to learn and very eager to please. 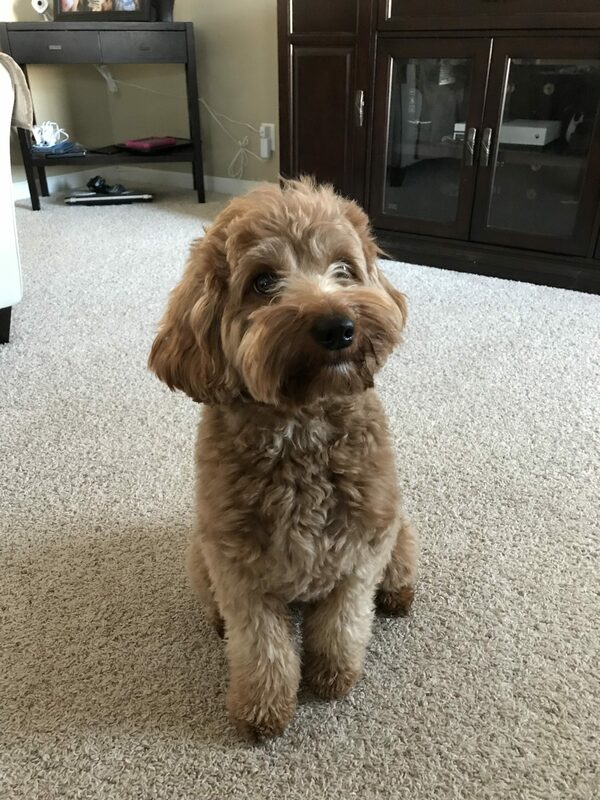 She has her moments of high energy but is very quick to settle down. She is very attentive to how others feel and behave. When Stella (our older lab) and Angel play as soon as Stella tires out Angel will give up playing with her fairly quickly and go off to play with herself. You could tell when Stella had surgery that Angel noticed and was very careful around her. Angel also loves to chase the squirrels in our yard, you should see them run! Angel is a lovely apricot color. She is a medium apricot beauty with a fleece coat who was born in 2011. Angel has a delightful personality, full of love! 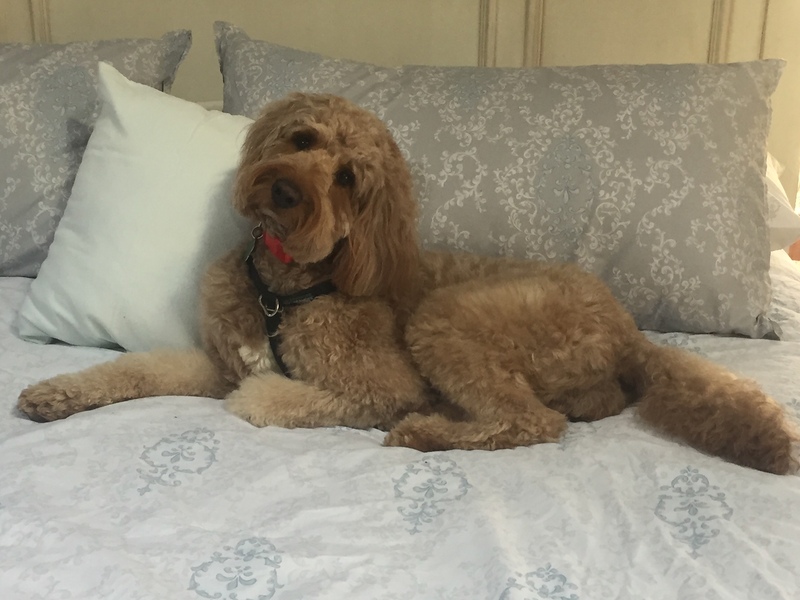 Ashford Manor’s Angel is mellow and easily trained as our most of our dogs. Angel lives with her guardian family in Lafayette, Indiana. Size: Medium – 18″ tall and 38 lbs. Duchess is a stunning ruby red color that shines even more in the sunlight! She is absoloutely gorgeous, we are so proud to have her. 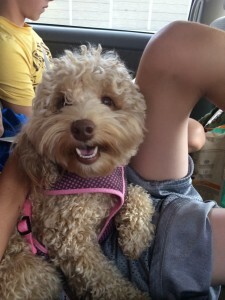 She has such a delightful personality as well, she has been so obedient ever since the time she was a little puppy. She has been a dream to train! Duchess has retained her dark red color, which is very rare and extremely beautiful. She lives in our home. Summer Rose is our original breeding girl, who is now retired. 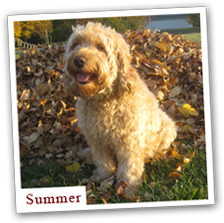 Summer has left a wonderful succession here at Ashford Manor Labradoodles! Summer is the happiest dog on the planet! She wags her tail and smiles at people, hoping to get you to pet her! She loves to follow us around, especially Cheryl. She is so mellow and calm that sometimes we hardly know she is even around. She loves everyone, regardless of age. 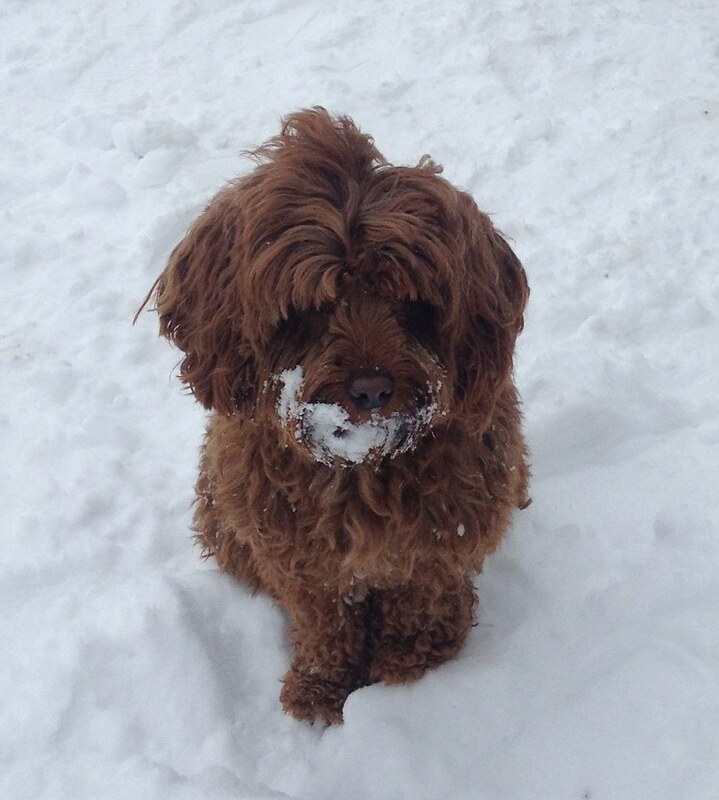 Summer loves to go on walks and runs no matter what the weather. She is a fantastic mom always caring for her pups and making sure they have everything they need. 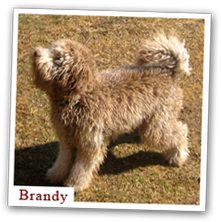 Brandy is now retired. She is a beautiful lavender color, a very rare color group. It is striking to see her lovely lavender shade in the sunlight! Brandy loves to give kisses, I think she could give them all day long! She is such a playful girl that sometimes I think she rather play than eat. She sure can make you laugh watching her do anything to get attention. Paprika is a miniature Apricot girl weighing 25 pounds and standing 16″ tall. 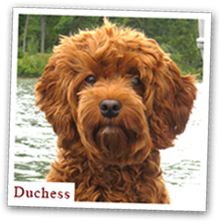 She is an Ashford Manor Duchess puppy, and she bears a striking resemblance of Duchess as a puppy, with the coloring of Summer! Paprika is a very mild mannered girl who settles herself well. She has a wonderful fleece wavy coat! 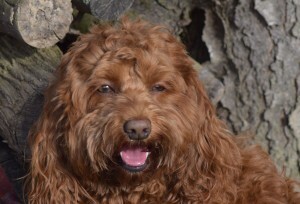 Tinsel is a gorgeous deep red mini Australian Labradoodle with a fun personality. She loves to be petted and is very calm. 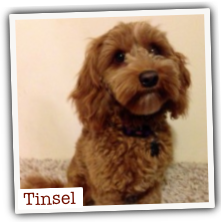 Tinsel weighs 16 pounds and stands 15″ tall, this is a perfect size for any family … small enough to climb on your lap and large enough to go run around outside. Pearl is a spunky little girl. She is ready to go for a walk anytime of the day or evening. Pearl loves to play with other dogs and children of all ages. She may be small, but she can cut corners and win the race! 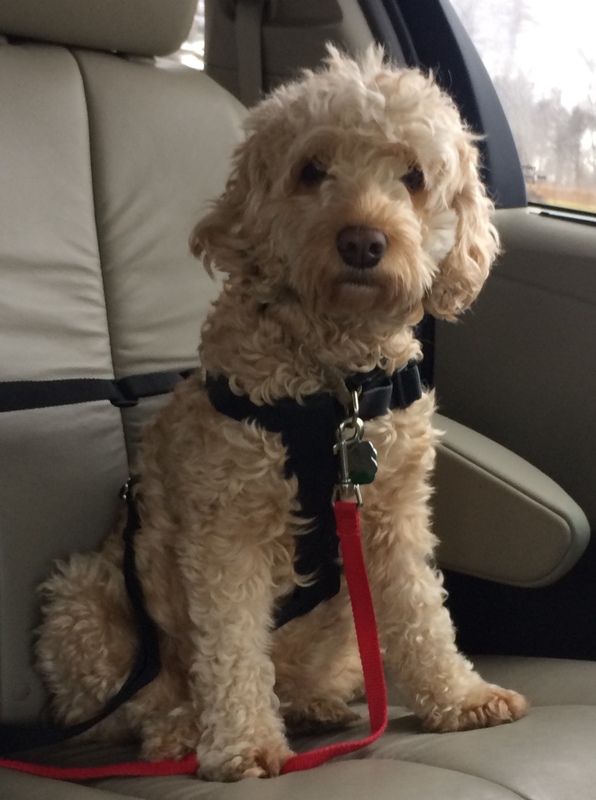 Pearl lives with her guardian family in Lafayette, Indiana. 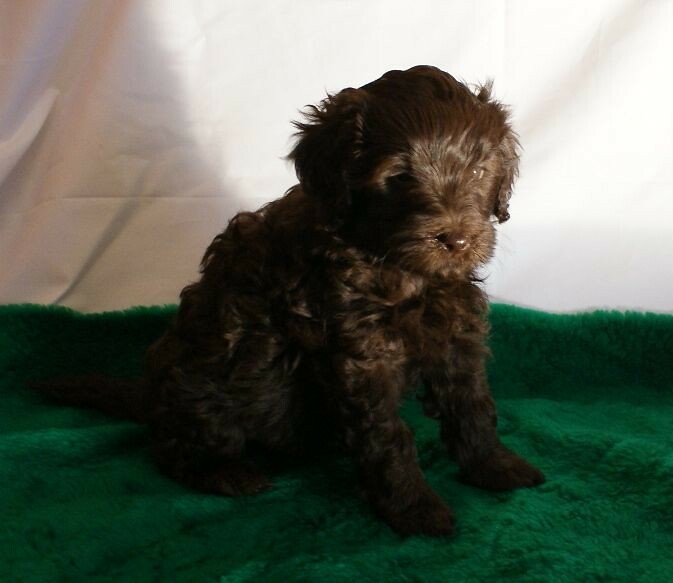 Valencia is a new breeder at Ashford Manor Labradoodles. 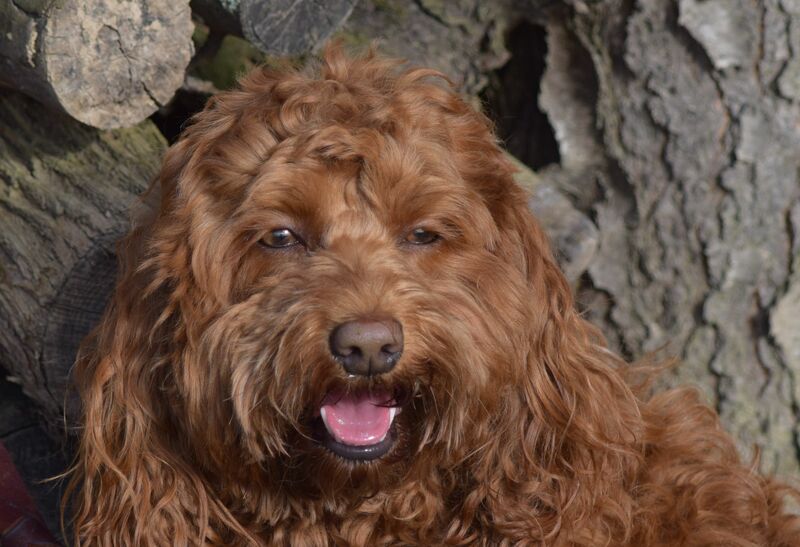 She is a beautiful red mini Australian Labradoodle weighing 20 pounds and 15″ tall. She has a gorgeous wavy fleece coat. Valencia lives with a guardian in the Indianapolis area. She is very obedient, playful, loves other kids and dogs. She is very intelligent and learns tricks quickly!